Here's a quick and easy dessert that would be a PERFECT ending for your holiday meal. It's kind of like one of those old timey "dump" cakes, where you just dump everything into the pan and bake it. Simple, huh? It's sweet and yummy and festive, all at the same time! And it's a Betty Crocker Recipe, so, you know it's tried and true. Oh, and don't forget the whipped topping! Heat oven to 350°F (325°F for dark or nonstick pan). Grease or spray bottom and sides of 13x9-inch pan. In medium bowl, beat pumpkin, milk, eggs, sugar and 4 teaspoons pumpkin pie spice with wire whisk until smooth. Pour into pan. Sprinkle dry cake mix over pumpkin mixture. Sprinkle with pecans. Pour melted butter evenly over top. Bake 50 to 60 minutes or until knife inserted in center comes out clean. Cool 30 minutes. To serve, cut dessert into 4 rows by 3 rows. 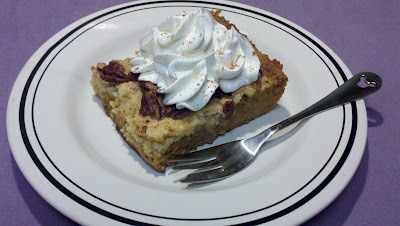 Serve warm or chilled with dollop of whipped cream sprinkled with pumpkin pie spice. Store covered in refrigerator. This recipe is perfect for a holiday meal because you can make it up to 2 days ahead of time and then just store it covered in the fridge. Instead of using whipped cream, I decided to use Cool Whip. It's easier and lighter and you can keep a tub of it in the freezer until you're ready for it. Then just defrost and top your dessert. Easy! I know the directions say to serve it warm or chilled, but I think it's SO much better when it's chilled. The top sets up a little more and becomes a little more crumbly, more like a crumb topping. Love.